RIO DE JANEIRO, BRAZIL – Rio de Janeiro has long been considered a popular landing spot for the Lesbian, Gay, Bisexual and Transgender (LGBT) community; and on Wednesday, September 28th, that reputation was cemented as the Cidade Maravilhosa was named the LGBT community’s favorite beach destination in South America. The honor was announced at the 44th Annual Brazilian Travel Agencies Association (ABAV) International Tourism Fair, Brazil’s largest tourism exposition, taking place in São Paulo all week. On Wednesday, September 28th, Rio de Janeiro was announced as the Best Beach Destination as voted on by the LGBT community, internet photo reproduction. Over two hundred representatives and leaders from the LGBT community from across the globe voted on the award last month in Buenos Aires, Argentina, at the annual convention of The International Gay & Lesbian Travel Association (IGLTA). The results of the vote, announced on Wednesday, had Rio garnering the most votes in the best beach destination category, at 51 percent. In second and third place were Puerto Vallarta, Mexico and Cancun, Mexico. With several well-known gay-friendly points among the city’s most iconic beaches, such as on Ipanema Beach at Rua Farme de Amoedo, and on Copacabana Beach between the Copacabana Palace hotel and Rua Fernando Mendes, Rio has always been a major destination for the LGBT community. Coupled with events, such as the world-famous Carnival and the annual Rio Gay Pride parade, the city has, for decades, drawn legions of LGBT travellers. 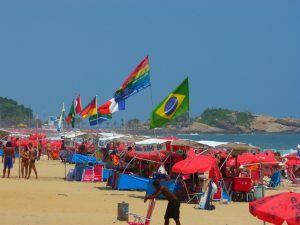 Rainbow flags flying high over the beach barracas on Ipanema Beach at Rua Farme de Amoedo, internet photo reproduction. 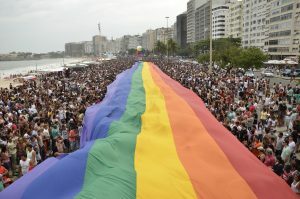 This year’s Gay Pride Parade, the 21st edition, is expected to take place in mid-November at Copacabana Beach. The parade coincides with LGBT Pride month and will include a series of gay pride events across the city for the entire month of November. Organizers expect the parade to draw over one million people. “It is a very positive recognition to receive this award,” expressed Lopes excitedly. It was also announced on Wednesday that Rio did well in the category for best LGBT urban destination, coming in second to Buenos Aires, Argentina, with São Paulo coming in third, right behind Rio.